I’ve always been into fitness. I used to be a hockey player. But I’ve never been an “athlete”. I did all sorts of stupid things to attempt to achieve the perfect “athletic” body – disordered eating, smashing myself 100% 7 days a week at the gym, not getting enough sleep, eating the wrong things. You name it, I did it. Making peace with my body came from educating myself. They say knowledge is power, and the more knowledge I gained, the more power and command I had over the demons eating away at my quality of life. I turned my hunger for the perfect body into a hunger for knowledge. I became more engrossed and passionate about the way the human body works, biomechanics, anatomy and the endocrine system, to the point where I decided to get my diploma of fitness coaching to become a personal trainer myself. It was this article that spiked my interest in competing. I embarked on my journey 6 months out from my goal date, unbeknownst to me that Mark Ottobre’s Enterprise Fitness was around the corner from my house, let alone right here in Melbourne. When I discovered Enterprise Fitness, the ICN Rising Star and Rookie Of The Year Show I had my sights on was a mere 7 weeks away. I was petrified this wasn’t enough time to get my body where it needed to be, but I picked up the phone anyway and was convinced without much persuasion that this place was the perfect fit- on an educational level as a personal trainer myself, as a competitor… And just culturally. To my absolute luck, I was paired with Senior Coach Nathan Madder, who steered me in the right direction. Within the first two weeks, I dropped 2% body fat. 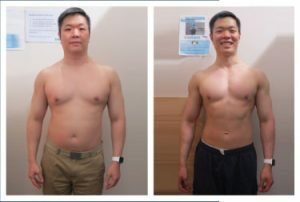 Within five weeks, Nathan had me from 14%, down to 10%, while maintaining muscle mass. Not only that, Nathan had me training five days a week, enforcing that resting was just as much a part of this journey as time in the gym. I learnt SO much about my body. For the first time in 15 years… Actually possibly ever, I’m in touch with my body. I know what makes it work. I know what to put in it and how to work it to get the results I want. Nathan answered all my silly questions and stayed in touch with me day and night throughout the preparation phase, and was the best support on the actual comp day – he calmed me, got me a coffee, checked in with me frequently and emotionally held my hand through the entire day – because this game isn’t just a physical one, it’s very much a mental one – and when you’ve got somebody to lead you through that – it’s an amazing journey. 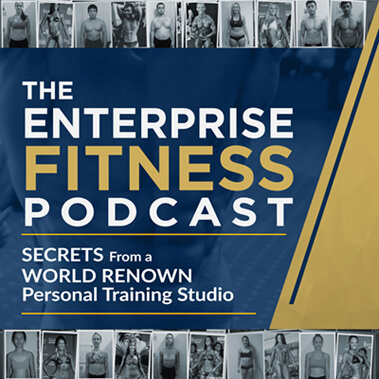 Nathan and Enterprise Fitness made me the athlete I’ve always wanted to be. Getting up on stage was the most exhilarating experience of my life – I’m already thinking about the next one!